I read a lot of books. Nearly every book has some nugget of wisdom I can take from it, but it’s rare indeed when I read a book and feel like I’ve hit the mother lode. In 2018, I’ve been fortunate enough to read two books that I’ll be mining for years to come. People have a natural tendency to conflate the quality of a decision with the quality of its outcome. They’re not the same thing. You can make a smart, rational choice but still get poor results. That doesn’t mean you should have made a different choice; it simply means that other factors (such as luck) influenced the results. Duke gives an example from professional football. At the end of Super Bowl XLIX, the Seattle Seahawks were down by four points with 26 seconds left in the game. They had the ball with second down at the New England Patriots’ one-yard line. While everbody expected them to run the ball, they threw a pass. That pass was intercepted and the Seawhawks lost the game. Duke argues, though, that the call was fine. In fact, she believes it was a smart call. It was a quality decision. There was only a 2% chance that the ball would be intercepted. There was a high percentage chance of winning the game with a touchdown. Most importantly, if the pass was incomplete, the Seahawks would have two more plays to try again. But if the team opted to run instead? Because they only had one time-out remaining, they’d only get one more chance to score if they failed. The call wasn’t bad. The result was bad. There’s a big difference between these two things, but humans generally fail to differentiate between actions and results. Duke says that poker players have a term for this logical fallacy: “resulting”. Resulting is assuming your decision-making is good or bad based on a small set of outcomes. If you play your cards correctly but still lose a hand, you’re “resulting” when you focus on the outcome instead of the quality of your decisions. You cannot control outcomes; you can only control your actions. Note: As long-time readers know, I grew up Mormon. One of the songs we were taught as children has this terrific lyric: “Do what is right, let the consequence follow.” This has become something of a mantra for me as an adult. If I do the right thing — whatever that might be in a given context — then I cannot feel guilty if I get a poor result. It’s my job to do my best. Beyond that, I cannot control what happens. Duke contrasts poker (and life) with chess. Chess is a game of complete information, a game of pure skill. There’s no luck involved. At all times, all of the pieces are available for both players to see. There are no dice rolls, nothing to randomize the game. As a result, the better player almost always wins. (When the better player doesn’t win, it’s because of easily identifiable mistakes.) Because chess is a game of complete information, luck isn’t a factor — the outcome is only a matter of the quality of your decisions. It’s because our decisions are made with incomplete information that life sometimes seems so difficult. You can do the right thing and still get poor results. You can opt not to drink on New Year’s Eve, for instance, but still get blindsided by somebody who did to drink and drive. You made a quality decision, but happenstance hit you upside the head anyhow. Vizzini made a quality decision based on the information he had, but he didn’t have all of the information: both goblets were poisoned, and his opponent in this “battle of wits” was immune to the poison in the first place! Duke argues that in order to make smarter decisions, we have to embrace both the idea that there’s a lot of luck in life and the reality that we’re swimming in uncertainty. There’s a stigma in our culture about appearing ignorant, about being unsure. 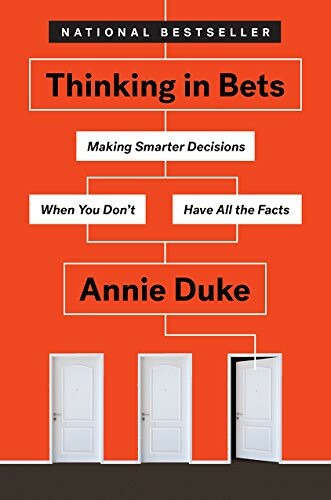 Duke says that becoming comfortable with uncertainty and not knowing is a vital step to becoming a better decision-maker. “Admitting that we don’t know has an undeservedly bad reputation,” she writes. Turns out I already do this to a small degree — but usually for minor stuff. In fact, I’ve done it several times in the past week. Because it’s been hot in Portland lately, folks in my neighborhood have all been taking early morning walks. We all tend to follow the same two-mile loop because it’s easy. I’ve started playing a game when I pass somebody. “Okay, the dog and I passed David Hedges at the llama farm. Where will we encounter him on the top side of the loop? I’ll be it’s between Roy’s house and the bottom of the hill.” It’s fun for me to see how accurate my guesses are. Let’s say you’ve only got $200 in the bank and it’s a week from payday. Should you join your friends for that weekend motorcycle trip? Or should you save that cash in case something goes wrong? Or, thinking farther in the future, what outcomes are you seeking in life? What decision will improve the odds of achieving those outcomes? Or, imagine that you’re trying to decide whether or not to buy a home. As you consider the possibilities, think about the probability that each possible future will occur. Don’t simply cling to the outcome you’re hoping for. Be objective. If the odds of success seem reasonable, then pursue your desired course of action. But if they don’t, then pull the plug. Every choice carries an opportunity cost. When you choose to save for the future, for instance, you’re giving up pleasure in the present. Or, if you choose to spend in the present, you’re giving up future financial freedom. For a long time, I’ve argued that the best books about money are often not about money at all. Thinking in Bets is another example of this. While Duke uses plenty of personal finance examples, the book itself is about self-improvement. It’s not a money manual. Yet the info here could have a profound impact on your financial future. There’s a lot more in this book that I haven’t covered in my review. (I’ve really only touched on the first third of the material!) For me, the biggest takeaway comes early: It’s vital to separate decision quality from results. The rest of the book explores how to improve the quality of your decisions. Learn to examine your own beliefs. Be your own devil’s advocate. If you’re certain about something, explore the opposing viewpoint. (If you’re liberal, seek conservative opinions. If you’re conservative, look for liberal voices.) Be skeptical — of yourself and others. But, as much as I wish it were, Thinking in Bets isn’t perfect. A strong argument could be made that this material would work better as a TED talk or a 5000-word essay in The Atlantic (or on Get Rich Slowly!). The book is so packed with info that it sometimes loses its way. There’s also a lot of repetition — too much repetition. Plus, it seems to lack a clear sense of organization. These quibbles aside, Thinking in Bets has earned a permanent place on my bookshelf. If I ever get around to putting together a Get Rich Slowly library (a project I’ve been planning for years! ), this book will be in it. I got a lot out of it. And I bet you will too.